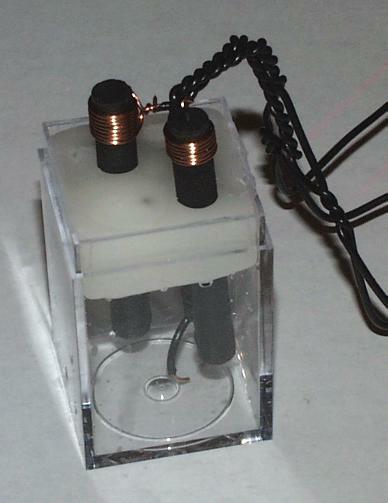 It sounds like the perfect terrorist weapon, but it is a toy that teaches the principles of electrochemistry. It's also a high-tech squirt gun. The Plastic Hydrogen Bomb uses electricity to break apart water molecules into hydrogen and oxygen. Then it uses a spark of electricity to explosively recombine the gases into high pressure steam, which propels a stream of water high into the air. The construction is a little more difficult than the other toys in this book, but the skills learned by building this toy can be put to good use building many other devices and works of art. Scrounging for bomb making materials. Polyester resin and catalyst. This can be found at hobby stores and hardware stores. 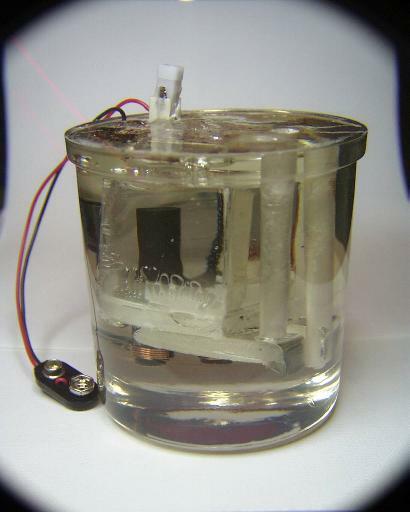 The 9 volt battery is connected to the carbon rods, which are under water in the bomb chamber. The water breaks up into hydrogen and oxygen, which is trapped in the upper half of the chamber. The piezo-electric ignitor from the electronic lighter is pushed, which causes a spark to jump the spark gap, which ignites the hydrogen and oxygen. The resulting high pressure steam forces the water out through the exit tubes, high into the air. The first few attempts at constructing the bomb. The first bomb I built was done entirely with the "lost wax casting" method used by artists, sculptors, and jewelers. In the lost wax method, a model of the finished object is made of wax, then plaster is poured over the wax and allowed to harden. Finally, the wax is melted out of the hardened plaster, and the hollow is filled with molten metal, which cools into the same shape as the original wax model. The plaster is broken away, and the finished piece of art or jewelry is cleaned and polished. With the bomb, we eliminate all of the steps after the wax has been melted out of the mold, since our objective is to build a hollow in the plastic into which the carbon rods and spark gap protrude. Note that the spark gap at the top of the bomb is made out of carbon rods. Later versions use a simpler spark gap made of copper wire. You can see the red wire from the battery clip going to the carbon rod at the bottom of the hemispherical chamber. You can also see a rectangular tube curving up from the bottom of the chamber and exiting out the top of the device. This tube was formed from a thin sheet of wax, and is there to let the water in and out of the chamber. There is another tube like it on the other side. The blue at the bottom is a pile of plastic beads that the wax model was sitting on when the liquid plastic was poured over it. The problem with the lost wax version is that you can't see the inner workings very well. My next attempt used a clear plastic box and some clear plastic tubing. It exploded in my face on the first attempt to use it. The remains are shown below. The plastic box was not strong enough to contain the force of the explosion, and the plastic tubes were too narrow and too long to let the water out fast enough to prevent the plastic from being blown apart. However, the new spark gap, made of twisted copper wire, worked perfectly. In succeeding refinements, the plastic box is completely covered with the polyester resin, so that the walls of the chamber are at least a half inch thick. The entry/exit tubes are drilled into the plastic, so they are straight and wide. A little bit of lost wax technology is used to provide a target for the drill, and so the wax can support the carbon rods and spark gap. 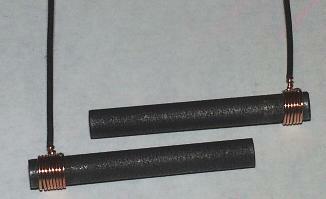 Construction starts with the removal of two carbon rods from a couple of old fashioned carbon-zinc batteries. 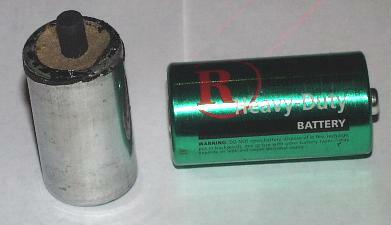 These are the cheap type, such as the Eveready 'Classic' or Radio Shack 'Heavy Duty' types, not the alkaline batteries that have largely replaced them in common use. In the photo below one of the batteries has the cover and top removed to show the carbon rod sticking up out of the cardboard seal. A little twist and pull and the rod slips right out, and can be washed and used. Next we attach insulated copper wire to the carbon rods by stripping the insulation off of a few inches of the wire on one end, and winding several turns around the rod, to make a good connection. The wire is tightly twisted to hold the connection securely. The spark gap is made by bending the insulated copper wire around a pencil, then twisting the ends tightly for a couple of inches. The loop is then cut, and some of the insulation trimmed from the ends. The spark gap and the carbon rods are then placed in the clear plastic box (the box from Tic-Tac candies will do if you don't have a cubical box as in the photo). The box is filled with water up to about a half of an inch from the top. Then melted wax is poured on top of the water to seal the box and the spark gap and rods. When the wax has hardened, it can be loosened a little to let the water out, then replaced to seal the box. Now we attach two thick pieces of wax to the bottom that will form hollow channels to let the water in and out. If you like, you can extend these all the way up to the top, making channels of square cross section. I like to drill the channels later, but you might like challenging people to guess how you drilled square holes in the plastic. 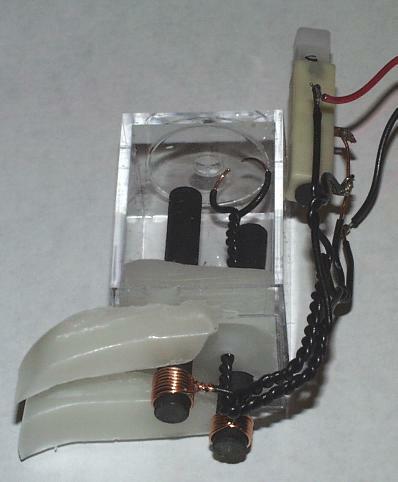 The next step is to take apart the electronic lighter to get the piezo-electric ignitor. The ignitor is the little gadget that produces a spark when it is pushed down. It has two contacts that need to be roughened with a knife or sandpaper before the spark gap's wires can be soldered to them. 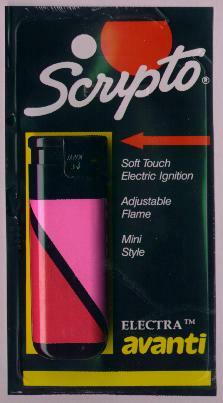 The larger lighters used for lighting fireplaces have larger ignitors that are easier to solder. You can see the larger ignitor is soldered to the spark gap in the photo of the box on its side a few photos earlier. 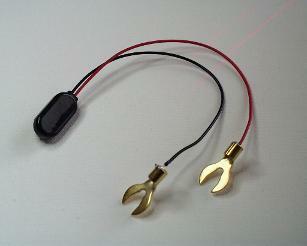 The wires to the 9 volt battery clip are also soldered to the wires that go to the carbon rods. The casting of the polyester resin is done in three steps. A tupperware bowl was used for the mold. The first casting is a thin layer on the bottom of the bowl. This layer is allowed to harden, to be a base on which to sit the carbon rods and the rest of the apparatus. The next casting layer is a half of an inch thick, and holds the carbon rods in place, and covers the wax outriggers at the bottom of the box. This layer is also allowed to harden before the last layer is poured. This ensures that the hollow box will not float to the top of the mold when the last layer is poured. The last layer is then poured, and should completely cover the top of the box to a thickness of at least a half of an inch. It will also cover the soldered connections on the piezo-electric ignitor, but must not touch the moving parts or get inside the ignitor, or the ignitor will be stuck and not operate. The penultimate step is drilling the entry and exit holes. I use a 1/4 inch drill bit. Finally, the wax is melted out by placing the project in a warm oven (no more than 150 degrees Fahrenheit), in a pan on top of newpapers to catch the melted wax. You can see the results in the photo above. The carbon rods are used because they will not disintegrate when the electric current is run through the water. If we used copper wire, one wire would be eaten away, and the other would get a plating of copper sludge on it that was removed from the other wire. However, if we use a less reactive metal, such as gold, this destruction of the wire will take place much more slowly, and the toy can be used many times without any noticeable changes. To test this, I made a bomb of design similar to the one we just made, but using some gold plated connectors used for high end stereo connections. To operate the toy, hold it under a faucet, tilted so that water can enter one hole and air can exit the other. The chamber should be only about half full, with a bubble of air keeping the spark gap dry. 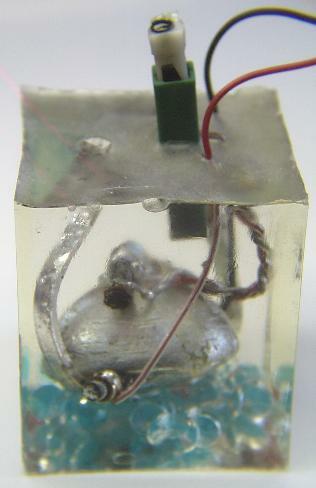 Plug in a 9 volt battery, and watch as tiny bubbles of hydrogen and oxygen form on the carbon rods (or gold electrodes). After about 15 to 20 minutes, enough of the gases will have formed for the bomb to explode with a nice effect. Note that as the gases form, the water is displaced, and leaks out the drilled holes. Hold the bomb at arm's length, and press the ignitor down until it clicks. The water remaining in the bomb and the tubes will shoot out, covering the ceiling and spectators. Some years ago I was demonstrating my science toys on a television show. Before the show began taping, we filled a bomb and plugged in the battery. After describing and demonstrating other toys for about 25 minutes, it was almost time to go. I held the bomb in my hands, and clicked on the ignitor, but nothing happened. I clicked a few more times, muttering something about the spark gap being wet. The host of the show decided to give it a try. He held the bomb, and carefully looked down the tubes as he clicked the ignitor. Of course it worked for him. The water splashed up into his glasses, his hair, his shirt, the ceiling, all over. The camera crew were laughing so hard you could see the camera shaking. Be very careful with bombs. 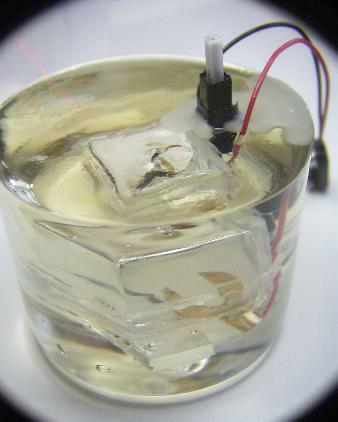 Using electricity to break up water is called electrolysis (Greek for 'loosening by electricity'). Water is made up of two atoms of hydrogen and one atom of oxygen. In the liquid form, the molecules are constantly breaking up into electrically charged pieces, and then getting back together. The electrically charged pieces are called ions. Water breaks up into ions by losing one of the hydrogen atoms. The nucleus of the hydrogen atom breaks away, leaving its electron behind, with the other two atoms. Thus we have a positively charged hydrogen ion H+, and a negatively charged hydroxyl ion, OH-. 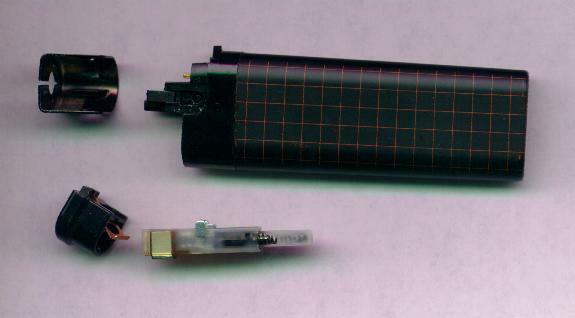 One of the carbon rods is attached to the negative terminal of the battery, and has excess electrons. 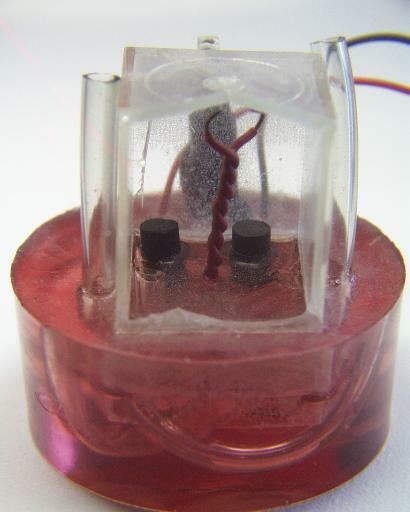 This electrode is called the cathode. The excess electrons attract the positively charged hydrogen atoms to the cathode. Two of the electrons on the cathode combine with two H+ ions, forming a hydrogen molecule H2. This molecule joins others and forms bubbles of hydrogen gas that rise through the water, making room for more water to contact the cathode and form more hydrogen. The other electrode is called the anode. The battery has pulled electrons from the anode, leaving it with a positive charge. This positive charge attracts the negatively charged hydroxyl ions to the anode. Four hydroxyl ions get together and form two molecules of water and one molecule of oxygen, while donating four electrons to the anode. The oxygen forms bubbles and rises through the water to join the hydrogen. It takes a lot of energy to separate the H+ ions from the OH- ions. This energy is stored in the form of the hydrogen and oxygen gases. Some of the energy comes from the chemical bond between the two hydrogen atoms in the hydrogen molecule. Likewise, energy comes from the bond between the two oxygen atoms in the oxygen molecule. Most of the energy comes from the battery. All of this energy is 'stored' by the mere separation of the gases into their respective molecules. If we could cause the atoms to rearrange themselves to form water again, that energy would be released. In order to cause the gases to reform as water, we must first add a little energy to break the bond between the hydrogen atoms, and a little more to break the bonds between the oxygen atoms. Only when these bonds are broken will the atoms be free to rearrange to form other molecules. The energy to break the molecular bonds in the gases is supplied by the spark. It breaks up the molecules of gas into their atoms, so they can recombine into H2O, releasing the stored energy as heat. The heat from those first recombinations is enough to break up more of the gas molecules, allowing them to recombine into water also. This reaction happens rapidly, consuming all of the gases, and producing quite a bit of heat. Almost all of the energy that the battery put into the system during 20 minutes is released in a small fraction of a second. The H2O that results from the reaction is too hot to be a liquid. It is a gas whose heat causes it to expand to take up much more space than the original gases needed. It expands, and pushes the remaining water out the only exit that exists -- the two holes that lead up to the ceiling.